Amazing adventures of Beta nad Bit! Beta loves math, books and puzzles. Bit loves to hack robots, crack passwords and run into troubles. Together they are a team of curious and unstoppable data crunchers getting to know the world around them through the prism of fun with the data. Beta's and Bit's word is full of puzzles, games and stories. Some are designed for elementary school students, the other for high school students and some can be solved only by the most experienced data scientists. Explore the amazing world of data together with Beta and Bit! How to weight a dog with a ruler? 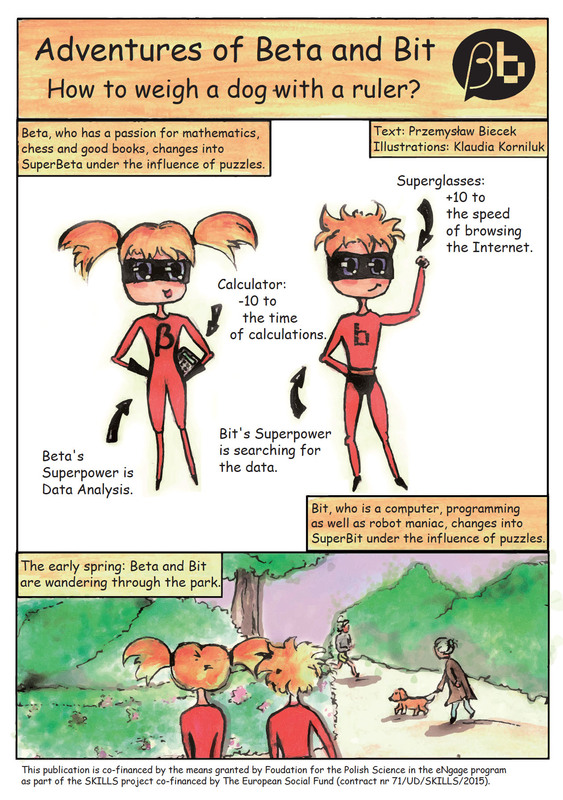 is the first comic books about Beta and Bit. Learn how to estimate the weight of T-Rex dinosaur with the use of linear regression! Download the pdf from this page. Pietraszko's Cave by Magda Chudzian is a story about Beta and Bit trapped in the labyrinth of time. In order to return to present times they need to hack the Pietraszko’s time machine. The story in electronic version is available here. Ready to hack the Pietraszko's password? The Proton Game is a text based R console game. Just install and load the BetaBit package from CRAN.